Heeft u een vraag voor Shanghai Hostel HK? Tijdens uw bezoek aan Hong Kong zult u zich snel thuisvoelen in Shanghai Hostel HK, dankzij de hoge kwaliteit en de goede service. Het hotel ligt niet zo ver van het stadscentrum: de afstand is ongeveer 0.1 Km en het duurt normaal ongeveer 35 minuten om het vliegveld te bereiken. Dankzij de praktische locatie liggen alle belangrijke trekpleisters in de buurt van het hotel. Bij het Shanghai Hostel HK staan de excellente dienstverlening en superieure faciliteiten garant voor een onvergetelijk verblijf. De topfaciliteiten van het hotel omvatten gratis wi-fi in alle kamers, 24-uur beveiliging, dagelijkse schoonmaak, snel in- en uitchecken, bagageopslag. Hotelkamers zijn zorgvuldig ingericht om het hoogste niveau van comfort te bereiken, met plasma tv, internet (draadloos), draadloos internet (gratis), airconditioning, bureau in iedere kamer. Daarnaast garanderen de talrijke recreatieve mogelijkheden dat u zich tijdens uw verblijf kunt vermaken in het hotel. 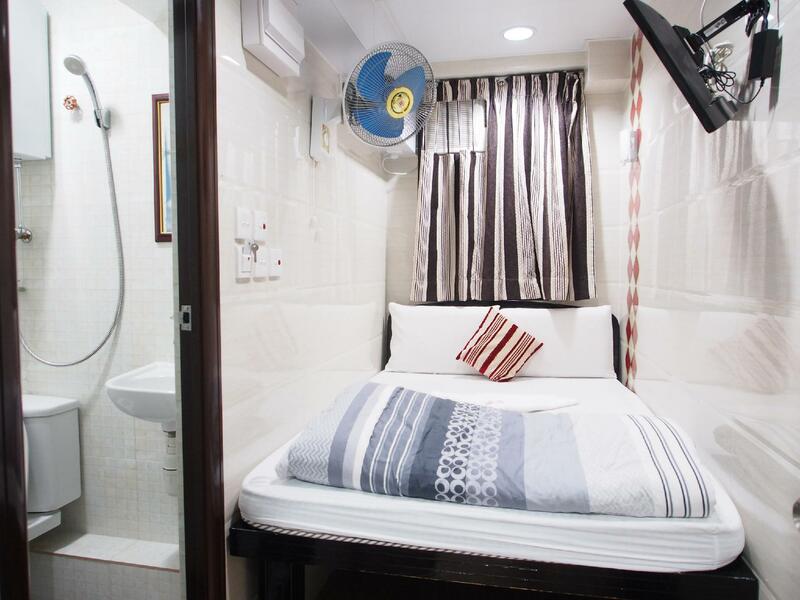 Wat de reden van uw bezoek aan Hong Kong ook is, het Shanghai Hostel HK is de perfecte keuze voor een enerverende vakantie. A 3m x 3 m room including bathroom and the shower is above the toilet. Dirty sheets and the second set of sheets were dirty too. At the entry to the building there were many Indian guys asking you to spend every day. Its cheap accommodation so thin walls - bring your ear plugs. There are no laundry facilities though an expensive laundry service 10 minutes away. Most of the middle-eastern guys staff spoke English. After read the bad reviews, I thought i can tolerate such budget hostel. Who knows, this is not the case. 1. This property does not liaise with agoda but only deal with booking.com. When arrived, this hostel staff told us the booking show in their system is 1 double bed instead of 1 double bed and 1 single bed. The staff asked us contact agoda ourself to settle this as this is not their problem. 2. Came to no choice, we stay for the night without arguing much. We been asked for HKD 100 as key deposit. 3. Then, as the booking type is “pay at property”, we ask about the payment, they said pay upon you check out. 4. During 12am-4am few hours rest, mental torture because the room is terrible small, window broken, terrible curry indian smell keep fly into room, downstair of the building are full of indian or arabian people, you will get shock as you feel like you are in another world but not Hong Kong, my wife and myself was having terrible mental sick in such terrible small room with size 5m sqft, my wife cannot breath well and feel stress , anxiety and cannot talk well, at 4am we want to leave this hell places by go to counter to ask to check out. 5. The staff said okay and tell us there will be no refund of the payment. We were shock! Because how could they can charged my credit card with my consent?! I never show them my credit card, i never sign any slip !!! The staff again, said they only deal with booking.com but not agoda! They are allow to charge my credit card! Horrible! Please do not stay this hotel, unless you can sleep in a dog cage or unless you think you are strong enough to handle anxiety consequence of staying such small room! One of the best hosts in Chunking Mansions. Do not expect too much from hosts in Chunking Mansions. You should understand that it is budget accomodation. The room was tiny but clean and staff is very polite. 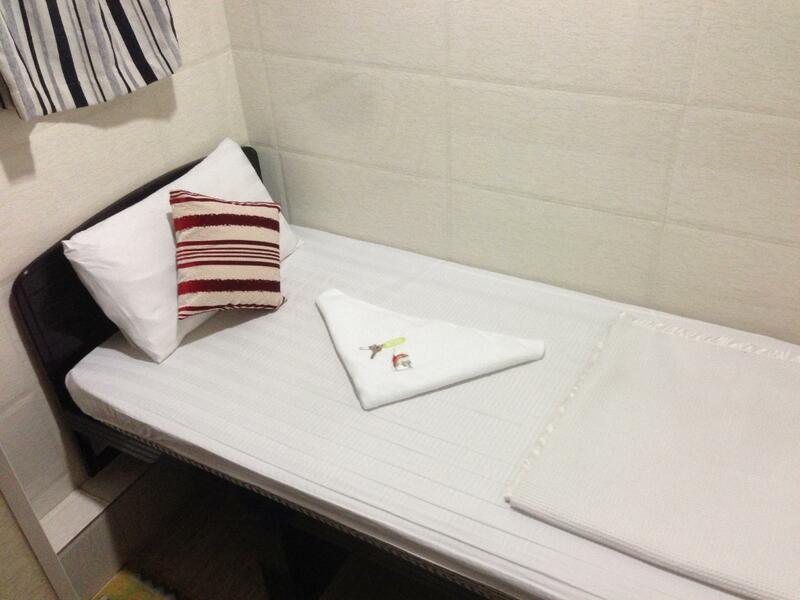 The room is super small, the room is the size of one queen size bed, no space to walk. The room we got is not the room we booked. There are tiny cockroaches in the room and the hot water shower is on and off with hot water. If you go on a budget trip and only want a room to sleep, this is recommended. The service are very poor. The bed, blanket, pillow , towel and toilet are very smelly. We called the service around 11:00pm to send some toiletries and the smell they said they slept already.. disgusting and never ever again..
Small Room, Room is not clean. I booked Shanghai Hostel but they moved me to another hostel. they has many hostel mange by Indian guy. I like the hostel. Everything is fine but bedding is not fresh! I found long black hair and some spots. Other things are good. Probably the best location in Kowloon. Direct bus A21 from the international airport to the hostel. Stopped in front of the mansion. Bad point of the hostel was the room too small for couple, ensuite will not fix an overweight customer. TV totally not working. Need to queue up for the lift as only accommodate at least 5 to 6 passengers excluding overweight. Arrived HK at night and check-in late at 21:00 but the hostel leave room booked and paid to another one. It's wrong and shouldn't do. Hostel let me wait for a new room. Elevator's too small and a lot of people to used. Recommending this hostel to anyone who's looking for a cheap room in a great location. (Although Chungking Mansion is quite a sketchy place, the people outside are fairly harmless) it's super near the MTR, the 7-11 and there's a Cafe de Coral & SaSa beside it. Plus Harbour City and Granville Road is walking distance. Also, they clean the room everyday and change the sheets. There's also free coffee and although the room's a bit small, the walls aren't paper thin. It's also good that it's just at the 3F so if the line riding the lift gets too long you have no problem taking the stairs. 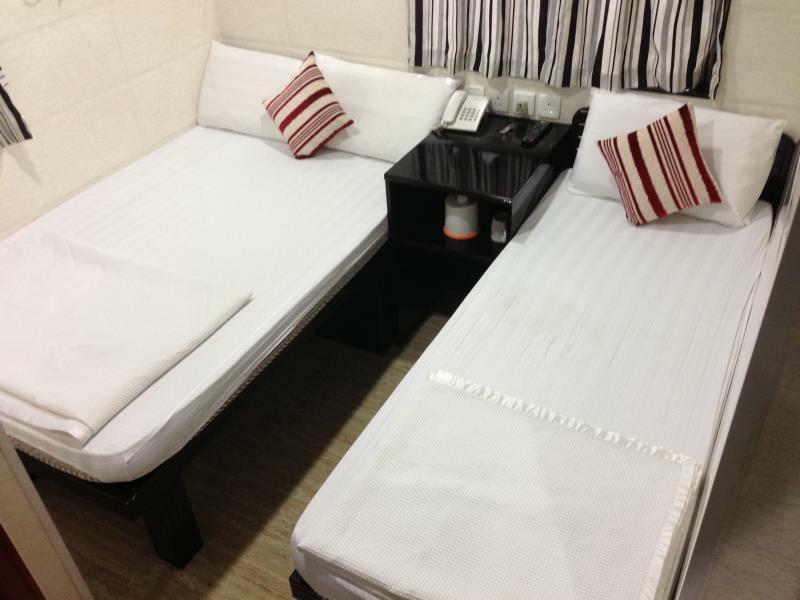 This hostel is in a good location, close to Victoria harbor and lots of shopping. It's reasonably good value for money. The room was quite clean but the bed sheets were very dirty. 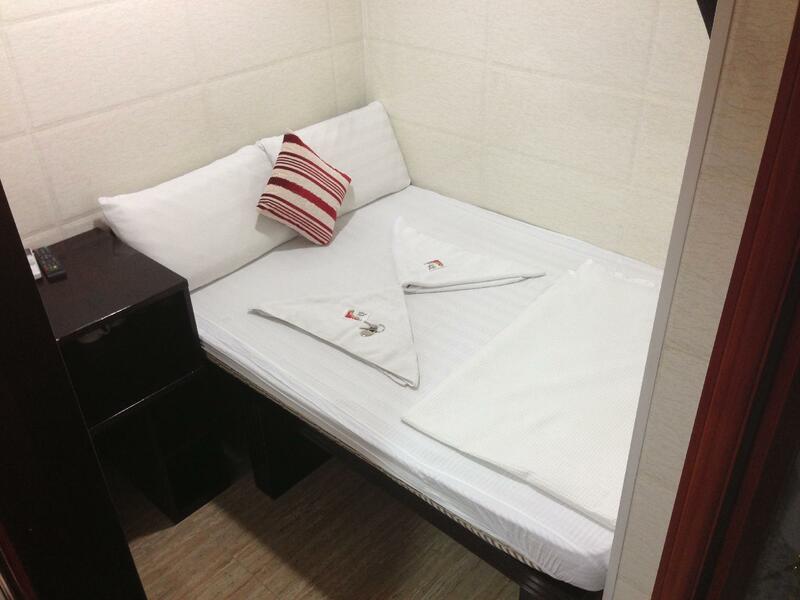 The room is very small but this is what you expect when you stay in Chungking mansion. The bathroom was clean but small, but the toilet didn't work very well. We only stayed a couple of nights, anymore and we would have changed hotels. We have stayed with the Canadian or Shanghai hostel the past three times in Hong Kong. 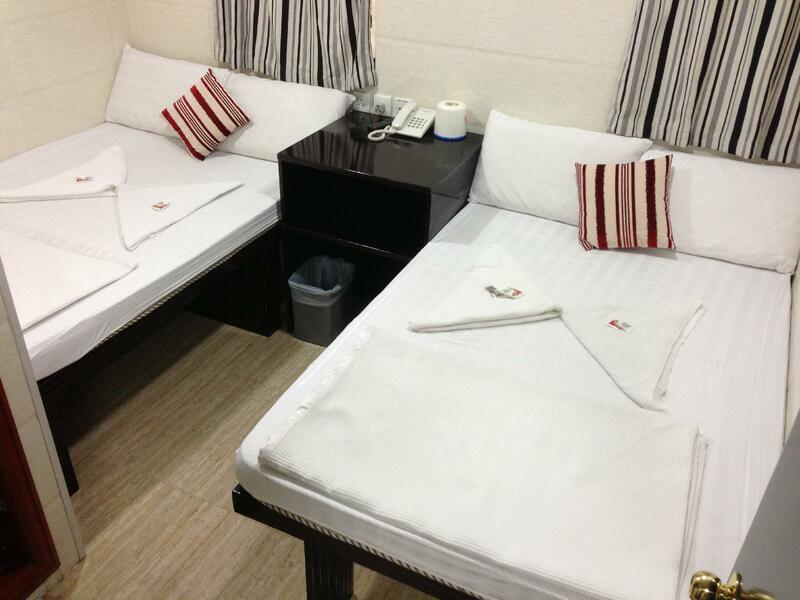 The rooms are small but clean and comfortable. And there is always great Indian food just an elevator ride away. The room is quite clean. Sheets, pillow cases and blanket are clean. No roaches or pests etc in the room. The room is really small. Towels had stains so we didn't use them since we brought our own. Fridge had a dead cockroach in it hence we didn't dare to use any of their shared facilities outside of the room. Water heater has some issues as well. Staffs are quite nice and friendly. Chungking mansion itself is quite scary because of the black Americans and Indians on the ground floor especially on weekends. But good location - MTR is just opposite. Will stay here again but won't recommend solo female travelers to stay in Chungking mansion. Good. We'll except for the few things -- The elevators are such a pain in the arse. Almost always full. Good thing our rooms are on the 3rd floor, so we can easily access the stairs. The "manager" during our 8 days stay there was quite difficult to deal with. well at least at first. They wouldn't let us exchange/barter booked days in the hotel, they end up offering us lower rates but we've already decided and booked for a different hostel of the same floor for a cheaper price than their first offer. So we checked out for one night and came back for the rest of the booked dates. Some of the blankets and towels are stained. During our last night there was a leaking (of a yellowish material. God knows what that was.) on the ceiling and they transfered us to a different room. The "free" bottled waters in the fridge are actually refilled with tap water. So yeah, just so you know. Good Points -- Booked the family room and surprisingly it's just adequate for 4 adults. though the sizes of the bathrooms defer per room. Super clean (maybe the cleanest in Chungking Mansion) or maybe just because it's newly refurbished. To the cleaning guys, please maintain the cleanliness and newness. There's a microwave, fridge, flat iron, electric pot (water heater) and free coffee for everyone. Location A++ Just across Tsim Sha Tsui station, few minutes walk form Ave of stars and Harbour City and a few minutes ride away from Kowloon Ferry Terminal. There' a bus stop from and to the airport a few meters just across the street. 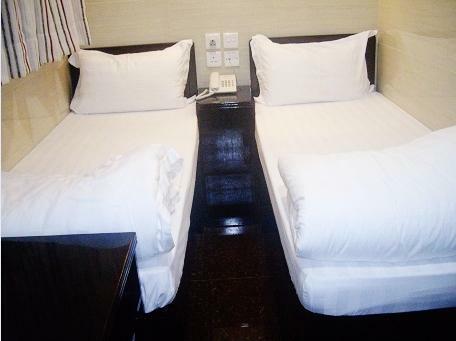 The Shanghai Hostel is one of many similar establishments within Chungking Mansions. The first few floors are taken up with stalls selling everything from suitcases to electronic equipment, food stalls Situated on Nathan Road, we were close to everything. Many restaurants of all types in the vicinity, and an MTR Station was opposite. Bus stops all along this road. Public transport very easy to use - buy an octopus card, which can be used on all public transport, and a lot of shops, and top it up when it gets low.The rooms are very small - no cat swinging competitions taking place here! We had 3 triple rooms with 2 people sharing each. The double bed is not big enough for two westerners. The bathroom was tiny, and it took some manoeuvring to close the door, but once inside, the shower was hot and powerful. The rooms were adequate, as we were out most of the time, and only used them to sleep and wash. Good value for money, and perfectly located in the centre of Nathan Road. We arrived late at night (2am) and the first floor was dark with lots of people loitering. Could be a problem for family travelers. There was ample CCTV cameras though so I'm sure it's safe. The room was very small but clean. The aircon ran well. Best feature is the great location!